In the 1950's, Native Americans were commonly featured in films as the enemies of cowboys. Disney was one of the few studios that was sympathetic to indians, often painting them in a positive light. And while civil rights for Native Americans didn't become a political issue until the 1970's, Walt Disney was ahead of his peers with films centered around indians. Tonka is based on the story of Comanche, the single horse to survive the Battle of Little Big Horn, also known as Custer's Last Stand. It was originally conceived as a 5 part episode of Disneyland, but was filmed instead as a single film. Tonka begins as an indian named White Bull tries to catch a wild horse and fails, losing a rope that he borrowed which gets him into trouble. While searching for his bow and arrow, he finds the horse tangled up in the rope, so he fences him in and keeps him a secret. He names the horse Tonka and trains him in secret. He eventually brings him back to his villiage, where Yellow Bull claims the horse as his own and mistreats Tonka. White Bull decides to free Tonka to prevent him from being abused more. Tonka ends up in the hands of Captain Miles Keogh of the US army, who names him Comanche. As General Custer plans genocide on the indians, the indians develop a plan to defend themselves against the white soldiers. When White Bull finds out that Tonka is with the army, he goes to visit him and is found by Captain Miles, who is kind to him after realizing their common interest in the horse. When the army arrives to surprise the indians, they are surprised to find that the indians were waiting for them. The entire army is killed and many indians died in the battle as well, but White Bull and Tonka survive. Tonka (Comanche) is given a medal for being the only survivor on the army's side and White Bull is put in charge of Tonka. Walt Disney's Tonka was released on December 25th, 1958. Critics loved it, praising the excellent writing and performances as well as the lush shooting locations. I was unable to find box office records for the film, but it was most likely a success because it was broadcast on TV multiple times before the advent of home video. However, since that time it has faded into obscurity and when most people hear the word "Tonka," they think of the toy truck company. I first saw Tonka in 2005 when a local video store closed and I purchased many of their Disney VHS tapes. I remember enjoying it, but soon forgot about it. Watching it again, I realized what an amazing movie this is. 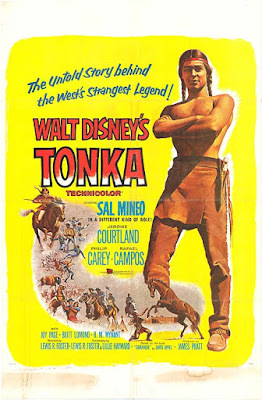 As an audience, you really feel for Tonka and White Bull, thanks in large part to an excellent performance by Sal Mineo in his only film for Disney. While the film is fictional, it is based on real historic events and the battle at the end is supposedly true to what really happened. Fans of Disney's Zorro might recognize Britt Lomond as General Custer because he played Capitan Monastario on the hit TV series. Tonka has even more in common with Zorro because it was written and directed by Lewis Foster, who wrote and directed many episodes of Zorro. Tonka was released on DVD in 2009 as a Disney Movie Club Exclusive. The disc has no bonus features and the film is presented in fullscreen. While some Disney films of the time were released that way, it is more likely that the film was released in matted widescreen. Therefore, the DVD aspect ratio is most likely not the original theatrical ratio. At any rate, it's nice to have the film available at all, since it was out of print for nearly 20 years. It is also available on iTunes in fullscreen. i simply love this movie, and i simply love the way you wrote about it! do you know a sight where i can watch this film? wow, thanks heap!!!! i really appreciate it! Thank you for this review...it was excellent, and held close to what I remember having seen this film as kid...and wondering whatever became of it. The recent film 'War Horse' struck me as a bit of a updated 're-do' of the Tonka story and brought the Disney film back to mind. In my opinion,'War Horse' was also superb. Do see similarities between the two films...? Tonkawakan is the name I remember. Tonkawa means "they stay together". Supposedly, the reason he was not killed (since he was with Keough) was that even though he was severely wounded, Keough was holding onto his reins. " They stay together". Don't know if it's historically accurate, but sure sounds good. Sorry. Keough was killed. The horse, renamed Comanche, was the one severly wounded. Being a horse lover, it is one of my all-time favorite movies. I remember watching it at the Rivoli Theater in Falls City, Nebraska when it first came out. Sal Mineo was kind of an instant star as a result of this movie.